For many years, credible meteor observers have reported some shooting stars producing various acoustic noises at the moment they were appearing. However, knowing that the speed of sound in our atmosphere is around 340 meters per second and that fireballs generally appear at altitudes around 90 km, the sounds associated to the fireballs should be delayed by several hundreds of seconds. To explain these anomalous sounds appearing simultaneously with meteors, Keay (1980) proposed that some ELF/VLF (extremely low frequency / very low frequency) electromagnetic energy could be radiated by the decaying meteor and then transduced into audible sounds at the observer location. This ELF/VLF high speed vector is supposed to explain the observed simultaneity of sound and meteor light. A Global Electrophonic Fireball Survey performed by Vincovic et al. (2002) suggests that the electrophonic meteors, as Keay named them, produce a very wide family of hissing, swishing, rustling, buzzing, whooshing or … crackling sounds. Keay’s theory states that trapping and twisting the earth magnetic field lines in the turbulent wake of the largest meteors and then releasing them suddenly could be the reason for producing high power ELF/VLF radiation in the 100 Hz to 10 kHz range. Breech & Foschini (1994) explained that the Keay’s theory was only able to explain the long duration noises such as hisses and other high-pitched whistles, but not the pops, tics and other claps which were often reported. They developed their own “space charge model” theory which states that some sharp shock waves occurring in the meteor trail plasma could induce some sudden electrical field transients. Several tentatives for recording such electrophonic phenomenons, using microphones, video cameras and VLF receivers were performed these last decades (see bibliography). In fact, due to extreme rareness of the electrophonic phenomenon, instrumentally recorded electrophonic meteor data are very scarce and not statistically convincing. The purpose of the present experiment, “Searching for ELF/VLF meteors signatures” is simply to verify, by means of statistical analysis of coincidences between radio and meteors events and by spectral analysis of the candidate VLF radio events, that some meteors entering the Earth atmosphere are really radiating some detectable ELF/VLF electromagnetic energy. The aim of this study is to record in parallel as many ELF/VLF events and meteor detections as possible, to compare any incident radio signals (in the 20 Hz-20 kHz range) with any occurrence of meteors in the radio field of view of the observer, and to determine statistically if the radio events are significantly correlated with the incoming meteors. A signature analysis of each radio event related to a particular meteor is also performed in the frequency and in the time domain, as an attempt to perform a kind of taxonomy study of the meteor radio signatures, if any. To detect as many meteors as possible, the radio forward scatter method was selected (Rault, 2007), rather than the optical observation method. Compared to the visual/video meteor observation method, the forward scatter radio method is offering more opportunities to detect faint and bright meteors (up to several hundreds radio echoes from sporadic meteors per hour), and is not subject to disturbances from the Sun and Moon light or from any masking clouds or fog. A radio meteor detection system is able to work 24 hours a day, except for the few periods when an anomalous radio propagation phenomenon occurs, such as Es (apparition of a sporadic E layer ionized cloud) or in case of tropospheric propagation. The idea behind this is that by multiplying the number of meteors detections, the chances should be higher to identify interesting temporal correlations between the meteor arrivals and the ELF/VLF events. It has to be noted that the data reduction of such records is very challenging, because the ELF/VLF spectrum is crowded with natural and man-made signals. Each coincidence between a radio and a meteor event has therefore to be processed manually. - a stereo digital recorder. The equipment was designed to be portable, self powered and as light as possible. The reason is it has to be run in remote areas only, i.e. as far as possible from any power lines, cities or railways which always radiate a lot of hum and various anthropic noises. The data crunching set-up consists of a laptop computer fitted with a spectral analysis software which purpose is to process and to display simultaneously the data coming from the stereo channels. Most of the laptop computers are poor field audio recorders because most of them radiate a lot of various radio noises in the VLF to VHF domain. Furthermore, their embedded audio sound chipset does not generally fit the dynamic and frequency range required for the ELF/VLF records. This is the reason why a good quality digital recorder has to be preferred. The data recorded in the field are stored on Compact Flash memories which contents can be easily transferred to any computer for further analysis. As is shown on Figure 2, the portable equipment is protected by a watertight container and powered by a 12 V car battery. 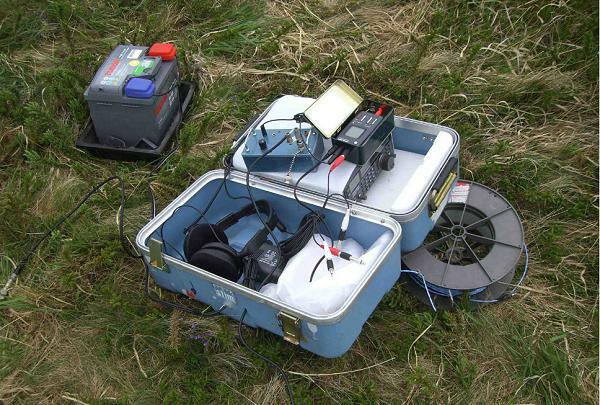 - several ancillaries such as a 12V LED light, a set of headphones, a batch of various cables, a laptop computer to control the records in the field and a “survival toolkit” including various tools, spare parts and a 12V DC soldering iron. 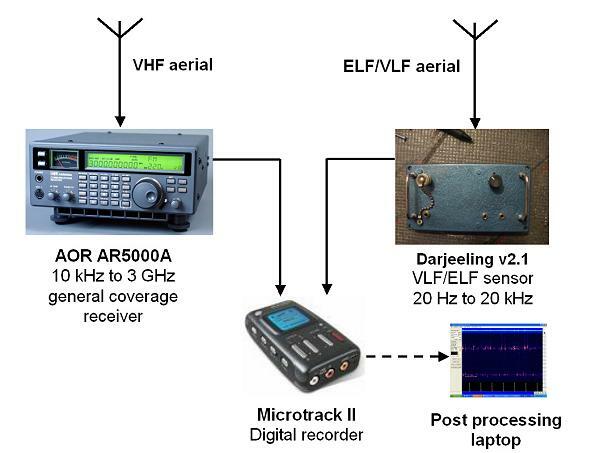 The frequency response of the Microtrack II recorder (20 Hz to 20 kHz +/- 0.3dB) and its dynamic range (101 dB at 48 kHz sample rate with 24 bits words) were used as metrics for the development of the associated ELF/VLF antenna and receiver. The antenna (specially designed for this experiment) is a one meter long metallic cylinder and its diameter is 50 mm, which gives a capacitance of about 29 pF allowing good performances even in the ELF part of the radio spectrum. - the capacitance of such a large diameter antenna is higher than the one of a thin whip, improving therefore the low cut-off frequency of the reception chain. Such a low series capacitance antenna implies the use of a very high input impedance amplifier. A FET/BJT (Field Effect Transistor / Bipolar Junction Transistor) cascode front end design was selected, because of his intrinsic qualities, such as high input impedance, low noise, low distortion and high dynamic range. The detailed diagram of the ELF/VLF receiver is shown on Figure 3. Its simulated band pass is shown on Figure 4. The 2SK170 FET and BC550C BJT transistors were selected owing to their good performances in the noise, dynamic range and distortion domains. The gate of the FET transistor is grounded thanks to a 100 megohms resistance made of ten 10 megohms low noise metallic film resistors wired in series. This very high value resistance is mandatory to keep the low cut-off frequency performance of the whole reception chain as low as possible. The 470 kilohms R14 resistor, which is not mandatory is used to protect the receiver against any high level RF fields which could be received from nearby or powerful broadcast transmitters, if any. R14 can be removed if the receiver is to be used in radioelectrically quiet places. The first filter is a 4 kHz low pass filter, the second one is a 10 kHz filter. To obtain good filtering performances, it is important to respect as much as possible the values of the R and C components constituting the Butterworth filters. 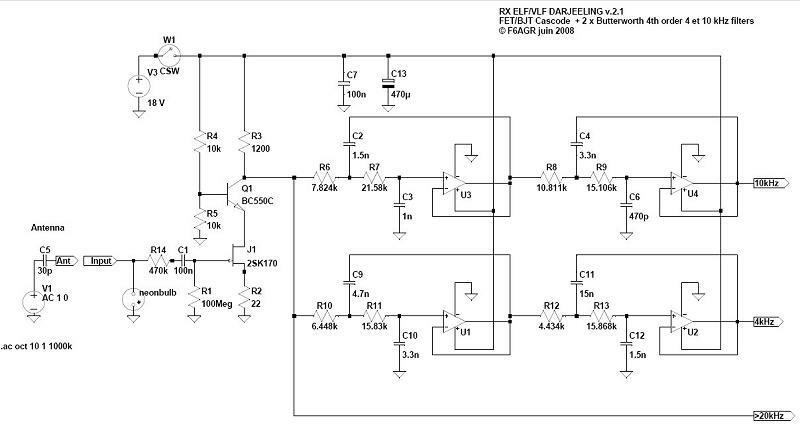 This can be achieved by using series or parallel combinations of resistors chosen in the 1% tolerance family. A low capacitance coaxial cable, which length has to be as short as possible, must to be used to connect the antenna to the receiver input. The model of cable which is used for car radio antennas has to be preferred for the present experiment. Its lineic capacitance is about 37 pF/m, instead of 100 pf/m which is a typical value observed on most of the usual 50 ohms coaxial cables. The preliminary tests of the ELF-VLF chain fitted with its 1m large diameter vertical antenna confirm the good behavior of the system in the lower part of the radio spectrum (see figures 5 and 6). - locating the system as far as possible (i.e. some kilometers if possible) from any power lines or buildings which always radiate a huge amount of hum, mains harmonics and various spikes. The analysis of the signatures of the VHF meteor pings, of the ELF/VLF signals and of their potential coincidence is performed by looking at the events signatures in the frequency and in the time domain, and by listening to them thanks to a stereo headset. For this purpose, a free Digital Audio Editor such as Audacity , or a more powerful but more complex Signal Analysis Toolkit such as Spectrum Lab are perfectly suitable. The VHF pings are radio echoes coming from a distant transmitter illuminating the meteors (or more precisely, illuminating the meteor ionized trails and/or the plasma surrounding the meteoroids themselves). The actual echo radio frequency (around 50 or 143 MHz) is translated by the VHF receiver into audio frequencies (20 Hz to 20 kHz) which can be easily perceived by the human ear and processed thanks to a common PC sound card. A frequency analysis of the incoming meteor echoes is the most suitable tool to study the meteor pings, because it gives details on the radial speed of the meteor and/or its trail. Potential meteor signatures have to be selected with a great care. The criteria for deciding an ELF/VLF event was potentially produced by a meteor was to select only uncommon low frequency signatures, i.e. signatures different from the well known sferics, tweeks, whistlers or local thunderbolts discharges. A 143 MHz transmitter was used for the Perseids 2009 campaign. More than 20 hours of VLF and VHF radio observations, i.e. about 20Gb of data were recorded during the pre-Perseids 2009 (the 6th of august in Brittany) and the Perseids 2009 (the 11th and the 12th of august in Corrèze). Ten hours ten minutes of data records were carefully analyzed, mainly during the first and second burst (i.e. around 8 AM and 6 PM UTC) of the Perseids but not during the third burst at 6 AM UTC on the 13th of august which was not recorded). For these 500 meteors, 174 coincidences were observed with ELF/VLF events, which gives 35% of candidate meteors radiating some very low frequency electromagnetic energy when entering the Earth atmosphere. - The signature of the associated ELF/VLF event had to be of unusual amplitude or shape compared to the well known common natural noises signatures. Some examples of remarkable coincidences are shown on figures 8 to 13. A tentative VLF/VHF observations campaign was performed one year ago with the help of Renato Romero. The live VLF data received in Cumiana, Italy by Renato were retrieved from Internet and compared to the VHF meteor pings detected near Paris, France. However, there was an unpredictable jittering delay on the VLF live data received from Internet, and no useful correlations were therefore possible. In another attempt, Renato recorded VLF data on DVDs and sent them to me. However, time synchronisation issues occurred again, because the sample frequency used by Renato was never exactly the same as the one produced by my own computer, so again the VLF/VHF correlations task wasn't possible. All these examples were selected for this paper because they look representative of interesting ELF/VLF meteor candidates, their low frequency radio signatures being clearly different from the usual natural noises. It is to be noted that almost all of the detected ELF/VLF meteor events occurred during the decaying phase of the meteoroids, and not during the trail echo phase. This is tending to prove that the radio frequency radiations, if any, occur mainly during the ablation phase of the meteors and are not generated by any persistent trail plasma phenomenon. Figure 11 is an example of an unusually large long-tailed spike (thirty four similar ELF spikes were identified during this study). 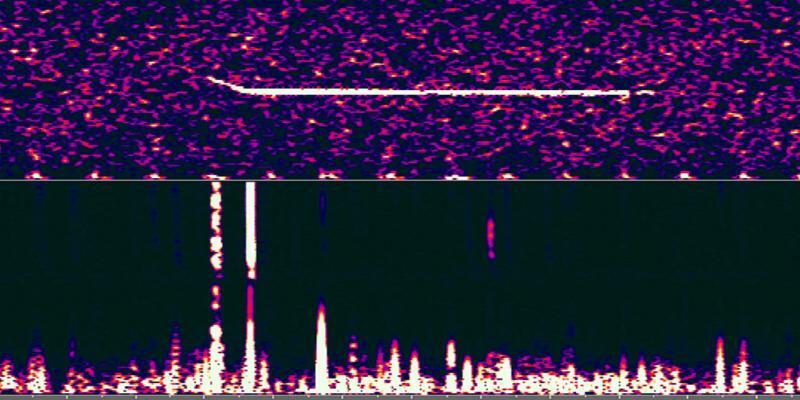 Figure 13 shows a burst consisting of some uncommon saw tooth spikes which period is around 4 ms.
A good knowledge about the VHF echoes signatures and the ELF/VLF events shapes is mandatory for correctly identify the potential candidate samples. Looking for correlations between meteors and ELF/VLF events is a very demanding and a very time consuming task. The detection of the interesting events can't be automated, because the ELF/VLF events signatures are not known in advance. More details on this study and on the results are given in (Rault, 2009). The theories stating that some meteors can radiate low frequency electromagnetic energy seem to be supported by the present practical study which is based on hundreds of actual discrete observations of meteors and ELF/VLF events. However, more data are still needed to confirm such a conclusion. The next most important meteor showers should be a good opportunity to collect more interesting correlations . Thanks a lot to Renato Romero for his various tries to furnish VLF data in different ways for this present correlation study. Beech M., Brown P., Jones J. (1995). “VLF detection of fireballs”. Earth Moon and Planets 68: 181–188. Cummer S.A. (1997).”Lightning and remote ionospheric sensing using VLF/ELF radio atmospherics”. Stanford University thesis. Drobnock G.J. (2001). “Meteors producing VLF signatures independent from producing electrophonic sounds”. WGN 29:1, 45-50. Drobnock G.J. (2002). “VLF signatures from non-fireball meteors – Observations from the 2001 Leonid shower”. WGN 30:5, 152-156. Guha A., De B.K. , Roy R., (2008), “Possible detection of GEMINID 2007 meteor shower during day-time from VLF Radiation Spectra”. Earth Moon and Planets, april 2009. Keay C.S.L., (1994). “Audible fireballs and geophysical electrophonics”. Proceedings ASA 1994, 11 (1) 12-15. Price C., Blum M. (2000). “ELF/VLF radiation produced by the 1999 Leonids meteors”. Earth Moon and Planets 82–83: 545–554. Rault J.L. (2003). "A la découverte des fréquences basses". Radio-REF, january and march 2003. Rault J.L. (2007). “ Radio observation of meteors – Leonids as an example”. Observations & Travaux, vol. 65, 1-8. Trautner R., Koschny D., Witasse O., Zender J., Knöfel A. (2002)“ULF-VLF electric field measurements during the 2001 Leonid storm”. Proceedings of Asteroids, Comets, Meteors - ACM 2002, 161-164. Vinkovi? D., Garaj, S., Lim P.L., Kova?i? D., Zgrabli? G., Andrei? Ž. (2002). “Global electrophonic fireball survey: a review of witness reports – I”. WGN 30:6, 244-257.